SAN DIEGO - Jan. 8, 2019 - PRLog -- In September of 2017, It's All About the Kids® Foundation ("IAATK") kicked off its Feed The Kids Program in Barrio Logan. Its mission is to bridge the weekend food insecurity gap for children in impoverished neighborhoods, with an emphasis on serving as a fresh food "oasis" for kids living in food deserts. At least two-thirds of its weekly distribution is fresh produce, along with two loaves of bread from local bakeries, and one large bag of non-perishables, including a protein. In 16 short months the program has expanded from weekly distributions at an after- school program to opening its own Feed the Kids Food Pantry. To date, over 222,281 meals have been provided to local families and the program is serving more than 5,000 meals each week to over 160 families. December 2018 was one of the busiest months of the year, with a Holiday Party on December 20, 2018, at the Food Pantry. San Diego's best companies joined IAATK's fight against hunger and hosted a festive party for kids and their families, over 700 guests in total. The party included its normal food distribution as well as a large turkey or ham, and a $50 grocery store gift card generously donated by William Painter and EverPrime Concepts. Paul Batta of Batta Fulkerson and GBOD Hospitality Group's Raymond and Patrick Davoudi and Rodney Daylamy, served over 1,300 delicious chicken tacos and churros from El Chingon, along with cake and cookies from Village Mill Bakery [which donates bread each week to the Food Pantry]. The kids enjoyed making ornaments, poinsettia pens and thank you notes, and taking photos with Santa. Everyone received stuffed animals from Santa, balloon creations from the Balloon Chef, and danced to Casa Nova (Revive SD). Additional donors included Batta Fulkerson, Five Group, John R. Mabee, Panera Bread, Albertson's, JWT Photography and William Gannon. 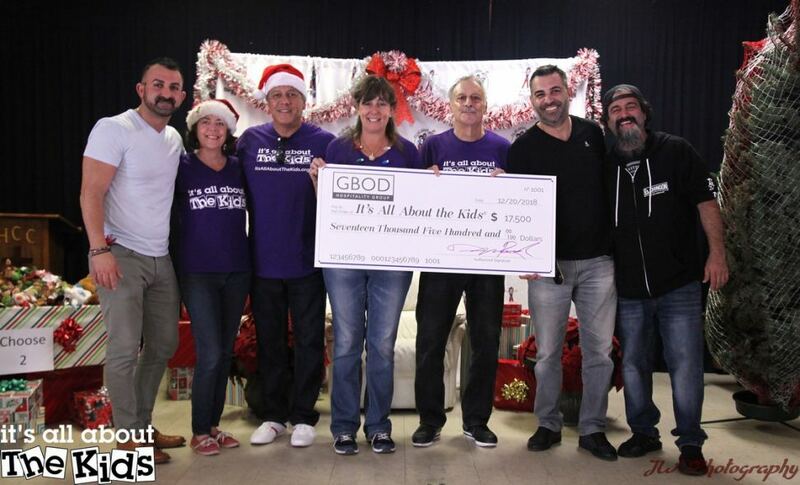 The afternoon kicked off with GBOD Hospitality Group awarding IAATK with $17,500 in support of the Feed The Kids Food Pantry. "God knows I have needed help before," said GBOD Hospitality CEO Raymond Davoudi. "I am so grateful that I am now in a position to pay it forward and help those who need it most. "